When it comes to eating a Sloppy Joe, how do you like to get the job done? For some, it requires two elbows on the table and two hands around the precious sandwich. For others, all it takes is one hand, one mouth, and it’s time to devour. 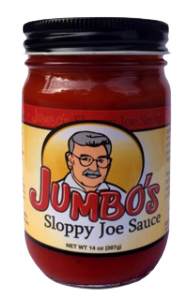 No matter how you approach it, there’s one indisputable fact: Jumbo’s Sloppy Joe Sauce is the Granddaddy! The sauce that started it all, it is packed with the perfect blend of sweet and tangy flavor that makes it the perfect do-it-all solution for Sloppy Joe’s and beyond! Whether it’s the backyard, family gatherings, or a meal to enjoy in the comfort of your home, treat yourself and your guests to a sauce that’s simply THE BEST. We’re about more than the every-day Sloppy Joe sauce around here. Jumbo’s Jalapeno Sloppy Joe Sauce is meant to give you everything you’ve come to expect in our classic original Sloppy Joe sauce with just the right amount of heat and jalapeno kick. When you want a kicked-up version of the original classic you’ve grown to love, reach for a jar of our jalapeno sauce. It’s time to experience incredible taste that adds mouth-watering flavor and a spicy flair to virtually ANY meal! 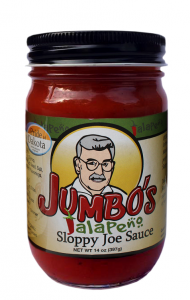 Ready to try Jumbo’s Sloppy Joe Sauce or just need to restock your supply?